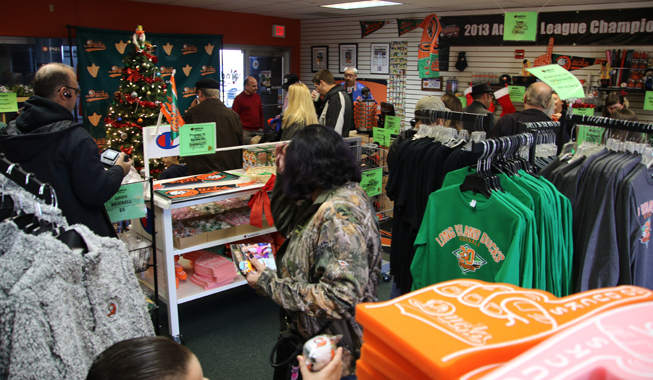 (Central Islip, N.Y., Dec. 1, 2018) – The Waddle In Shop, the official merchandise store of the Long Island Ducks, re-opened for the holiday season on Saturday, December 1st. The opening event included free photos with Santa Claus and QuackerJack, a visit from Lew Ford and the debut of new Ducks merchandise. The Waddle In Shop will remain open through Thursday, December 20th, with store hours of Monday through Friday from 9:00 a.m. to 5:00 p.m. Fans visiting the store can now purchase Wally Backman #6 Ducks T-Shirts as well as official 20th Anniversary Season merchandise, including adult and youth t-shirts, long-sleeve shirts and blankets. New Ducks merchandise is also available to gear up for winter, including sweatshirts, pullovers and knit hats. The store features many discounted items as well, such as caps, All-Star Summer gear and much more.